Music, loud and obtrusive, blares out across the Galuh Rehabilitation Center in Bekasi, Indonesia, on the outskirts of Jakarta. From inside their isolation cells, haggard men and women cling to the bars and cry out for help, for acknowledgement. In a rural Ghanaian prayer camp, 10-year-old Victoria's feet are covered with bumps and blisters. A heavy chain secured to a nearby tree is clamped around her legs. At a mental health facility in Hargeisa in Somaliland, Samatar sits on two meager layers of bedding. A thick chain snakes around his ankles, held in place by two gold-colored padlocks. All over the world, thousands of people with actual or perceived psychosocial disabilities, which refers to mental health conditions--people like Samatar, Victoria, and the men and women I met in Indonesia--are living in chains. Last week, as we marked the International Day for Support of Victims of Torture, these images of inhumanity were constantly in my mind. The reasons for chaining vary, but stigma and lack of information play a central role. Victoria was chained at Nyakumasi Prayer Camp because her family thought evil spirits possessed her. In Ghana and in many other countries, psychosocial disabilities are frequently attributed to such beliefs, and frightened families turn to traditional faith healers in prayer camps for guidance. Camp staff have virtually no mental healthcare training and impose prayer, forced fasting and herbal remedies to "cure" someone from their "curse." In many countries, a severe dearth of mental health resources present families with limited options. Of Ghana's total population of 26 million, an estimated 2.8 million people have some form of psychosocial disability. Yet the country has only 12 practicing psychiatrists. So too in Somaliland, where four under-resourced, dilapidated public mental health wards and expensive privately run residential centers attempt to provide support amid a high prevalence of psychosocial disability because of violence and trauma from the civil war, lack of health services, and widespread use of khat. Yet far from offering residents rest, rehabilitation or medical treatment with their consent, both public and private institutions largely serve as places of unlawful confinement, and subject many residents to forced treatment and other abuses. In Indonesia, the government banned shackling, or pasung as it is known in Indonesian, in 1977. 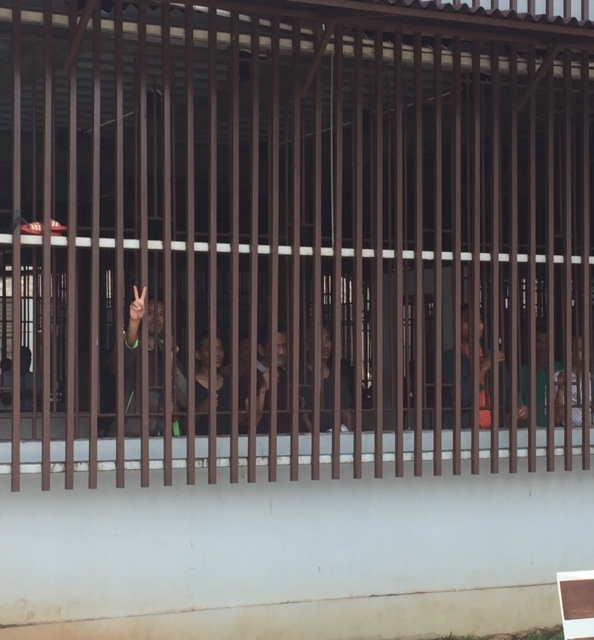 Despite this, the government itself estimates that over 57,000 people with psychosocial disabilities have been chained at least once and over 18,000 people currently live in pasung. This country of 250 million people has only 48 mental hospitals, more than half of them located in just four provinces of Indonesia's 34 provinces. In all of Indonesia there are just 600 to 800 psychiatrists--or one trained psychiatrist per 300,000 to 400,000 people. Having a disability does not justify being stripped of your humanity and fundamental rights. Shackling does far more harm than simply restricting movement. From the moment the chains are fastened, Samatar and Victoria are no longer recognized or treated as people. Suddenly, it becomes easier to threaten, abuse, and neglect them. In discussing this recently with Kim Samuel, the founder of a growing movement on social connectedness, I was struck by her insights on the profound consequences that prolonged isolation and neglect may have: "When a society views people with disabilities as less than human, this strips them of their power, their dignity and their right to belong." Recognizing its dangers, in the context of Ghana, Juan Mendez, the United Nations expert on torture, has called chaining a form of torture, and the World Health Organization has advocated an end to chaining as "treatment." An important first step to end shackling is to dispel the negative assumptions about what people with psychosocial disabilities can accomplish and amend the laws that deny their rights to make decisions about basic choices such as where to live or if they want medical treatment. Hand in hand with removing these restrictions is the need to develop rights-respecting alternatives for people who may want to access support or mental health services in their community. These alternatives need to make sure the individual's will is at the core. Without such reform, more hands, feet and freedom will be bound in chains.